People in the industry tend to make us all believe that everybody, including women, young children and the elderly, are rattling their videogame controllers these days. Nintendo was the first console manufacturer who specifically tended to the mainstream market, and all the rest followed. But approximately six years after the launch of Nintendo's DS, and three years after the release of the even more mainstream-oriented Wii home console, games are not nearly as mainstream as people in the industry want to make us all believe. Sure, they've become more mainstream. But not as much as you might think. We, the press in general, have greatly helped out in cultivating the games-gone-mainstream myth. We've extensively covered the advent of EyeToy games, Buzz! quizzes, the DS, brain games, the Wii, the fitness game craze, and so on. 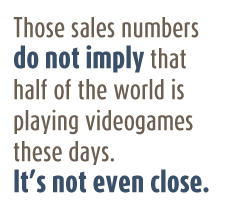 And we've always let videogame business types run their numbers game without taking a good look at the data. For instance, success in the videogame industry has always been defined through revenue numbers. There's Price Waterhouse Coopers' well-published estimate that the worldwide videogame industry was worth $52.5 billion in 2009, and will grow to $86.8 billion in 2014. When you read success stories about a certain videogame or a console, the focus is almost always on total revenue generated during a certain period, like first-week sales statements of popular properties, or mentions in annual revenue reports. One easily refutable myth, for example, is the one where the videogame industry is considered larger than the movie industry. It rings true when you only compare it to global box office sales of movies, which amounted to only $29.9 billion in 2009, according to the Motion Picture Association of America. But it's a much fairer comparison if you add DVD sales to that number: global sales of packaged film media in 2009 were $33 billion, according to consultancy firm Strategy Analytics. The worldwide movie industry, by that standard, is worth $62.9 billion at the moment. That's 10 billion dollars larger than the videogame industry. You can't even consider the sales boom of videogame consoles as evidence that videogames have gone mainstream. The total sales figure for the PlayStation 2, the most successful videogame console to date, wasn't such a big leap in comparison to the total sales its predecessor generated. The first PlayStation sold 102 million units over its twelve-year lifespan. The PlayStation 2 slid 146 million times on store counters all over the world. That's less than fifty percent growth: an excellent growth rate, but not the leap that other historical consoles have made over their predecessors. The first PlayStation sold more than double the amount of units the Super NES, which was the most popular console at its time, shipped during the first half of the nineties. The precursor to that console, the iconic NES, shipped approximately 62 million units during its lifecycle, which was again at least double the amount of Atari VCSes sold during the life of that console.